When buying perforated material, there are countless varieties of hole sizes, shapes, materials and gauges to specify which can affect the production process, quality, cost and lead-time of the finished product. Material – Choose the proper material, thickness and finish that satisfies the challenges of the application’s environment. Corrosion resistance, EMI shielding requirements and appearance may be some considerations. Hole shape – There are many hole shapes, but round holes in general are most common, especially arranged in a 60° triangular pattern. Hole patterns – Patterns can affect strength, performance, aesthetics and safety. When staggered, direction of the stagger will normally be the short dimension of the sheet. Straight row of hole is normally parallel to long dimension of sheet. Hole size – Industry standards recommend not making the hole diameter smaller than the material thickness. If you require a smaller hole, contact us to discuss your needs. 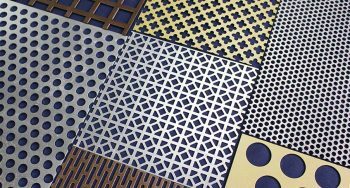 Perforating methods – Punching on a perforated press, CNC punch press and laser cutting are conventional methods. Punching on a perforating press is the most cost effective and provides a wide range of options. Laser cutting is ideal for small jobs or unique patterns. Open areas – Perforated patterns produce open areas from 2% to 80%. If possible, stay under 70% as extreme open areas can increase distortion in the material. Margins – Reduce distortion by keeping side margins to a minimum. Use the standard, minimal side margins with no end margins when possible. If required, end margins can accommodate either finished or unfinished end patterns. Flatness – Most requirements, perforated sheets or plates can be furnished to AISI flatness tolerances. In some cases like special alloys, or sheets with extra wide margins, call your Marco sales associate. Blank areas – Your required pattern will dictate the size of the blank and perforated areas. Always discuss any flatness requirements with your Marco specialist. Burrs – Accept normal commercial burrs. 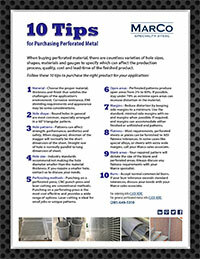 If your burr tolerance exceeds standard tolerances, discuss your needs with your Marco sales associate. Contact us today so our reliable and friendly sales associates can help determine the best perforated metal for your project. We fabricate perforated metal and all our products. Feel free to download or print the tip sheet below, or see our other handy resources section for more information and downloads.